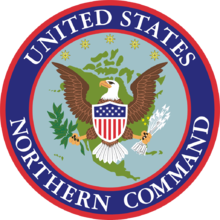 United States Northern Command (USNORTHCOM) is a Unified Combatant Command of the U.S. military tasked with providing military support for non-military authorities in the U.S., and protecting the territory and national interests of the United States within the continental United States, Puerto Rico, Canada, Mexico, The Bahamas, and the air, land and sea approaches to these areas. 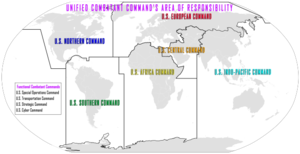 It is the U.S. military command which, if applicable, would be the primary defender against an invasion of the U.S. continent. ^ Bolkcom, Christopher; et al. (2005). "Homeland Security: Establishment and Implementation of Northern Command". In Thaler, William M.; Bea, Keith (eds.). Emerging issues in homeland security. Nova Publishers. p. 107. ISBN 978-1-59454-139-1.